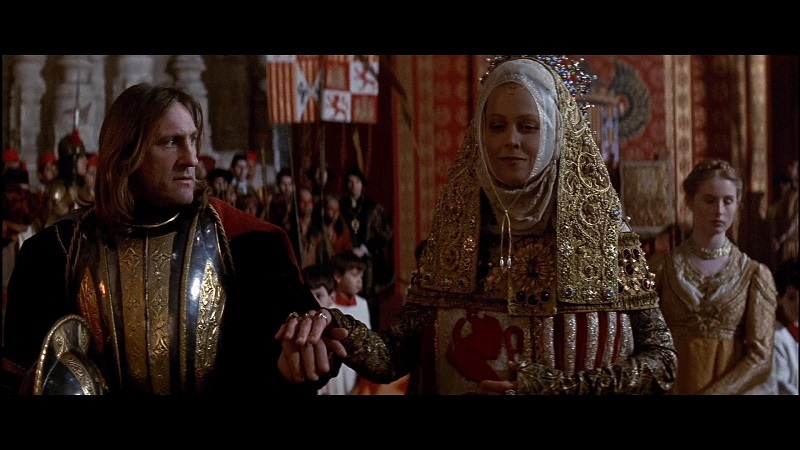 A flop at the box office in 1992 (at least in the United States), Ridley Scott's 1492: Conquest of Paradise remains one of the director's most ambitious and beautifully shot movies, which finally comes to Region A from Kino Lorber in what proves to be a mixed bag in terms of A/V quality. You can read about that in the sections below, but how does the film hold up after 25 years? Better than I expected, to be honest. I was fresh out of college (with a degree in History, no less) when this film had its theatrical run, so being both a fan of Scott's previous work and a scholar of things past, I remember being interesting in seeing if the movie was going to whitewash Columbus's story or give an accurate depiction of what we knew about him. While Scott more or less shows Columbus (played by French actor Gerard Depardieu) in a positive light, he doesn't shy away from depicting him (and those around him in various degrees) as having some moral ambiguity, and he also nicely doesn't pass judgment - allowing the audience to decide for themselves how good or how evil these characters are. The smartest thing Scott and the screenplay do here is not make the movie only about Columbus's discovery of the New World. The film is barely an hour into its 150-minute running time when the Niña, Pinta, and Santa Maria make landfall in San Salvador (the name Columbus dubbed it). Much of the story deals with the result of that discovery, as it soon begins to dawn on Columbus that by proving that he could go East by heading West (Columbus never accepted that he had discovered new land; he believed he landed in the Indies islands off Asia), he'd essentially doomed the natives there to being overrun - and worse - by Spaniards. Perhaps the biggest fault of 1492 is that it outstays its welcome, slogging along for a long two and a half hours when a tighter, shorter movie might have engaged viewers more. It probably also doesn't help that this isn't a happy story. It's hard to get behind a tale that, while it marked one of major steps in the beginning of modern civilization, also marked the beginning of the end for another society. Sure, one could argue that the events were inevitable, but celebrating and honoring them is perhaps not the best way to approach this bit of history (And, indeed, we've seen a growing sentiment that Columbus Day should no longer be a holiday at all, or - at the least - should be more a day of reflection than celebration). It's probably a good thing Ridley Scott got to film his Columbus movie back in 1992 (the 500th anniversary of Columbus's voyage, of course), as it would be virtually impossible to get a major Hollywood studio to back such a "positive" movie about Columbus today. In fact, the only way to approach the material again would be to go in the opposite direction...portraying Columbus as a homicidal, sadistic maniac...and, I don't know about you, but that's one movie I don't want to see. So here it is, for better or worse, probably the best Hollywood movie we're going to get on the subject (you can ignore 1992's Columbus: The Discovery - it's awful). I'm not sure it's worth a spot on your shelf, but if you're a Ridley Scott fan, it's certainly worth a look. 1492: Conquest of Paradise makes landfall on Blu-ray with a 50GB disc housed inside a standard Elite keepcase. Also included is a full-color 22-page booklet showing box covers from other available titles in the Kino Lorber "Studio Classics" library. 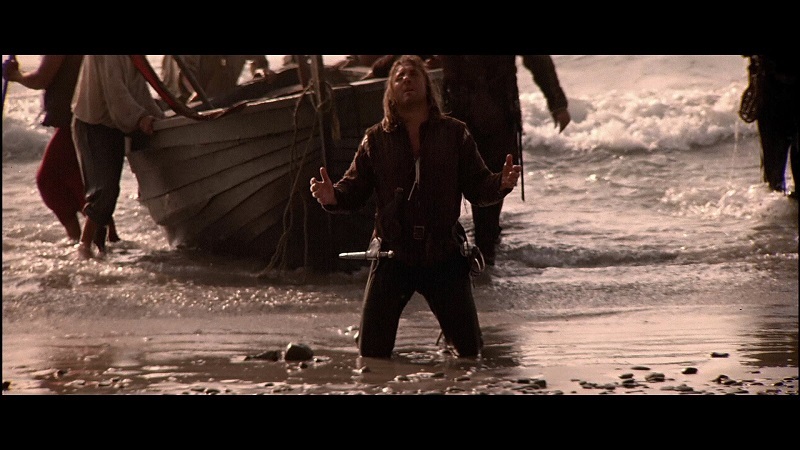 There are no front-loaded trailers on the Blu-ray, whose main menu is a variation on the keepcase's box cover, with Columbus/Gerard Depardieu storming the beach with his sword in the air (going towards the left) as opposed to having his sword lowered and being a straight-on look at him. The main menu's image is how the original theatrical poster for 1492 looked; the box cover is a variation on that poster image (and one that has been used ever since the movie hit VHS). Menu selections run across the bottom of the screen. The Blu-ray is in this release is Region A locked. Note: An incorrect run time is listed on the back of the keepcase slick. It lists a runtime of 154 minutes, which is actually the run time of the international version of 1492. The U.S. version of the movie (the one that appears on this release) is a bit shorter at 150 minutes, being edited down a bit so the movie could be released in the States with a PG-13 rating - which the box also gets wrong, listing the movie as a PG. (Unless it got re-rated at some point during its home video history). 1492: Conquest of Paradise was shot on 35mm film and is presented on Blu-ray using an AVC MPEG-4 codec at the 2.35:1 aspect ratio. Overall, I have some mixed feelings about the video quality here, which is far from the greatest. The bad news is that plenty of dirt and debris still exist on the print. Black levels aren't very strong at all, meaning things get really murky and hard to distinguish in 1492's dimly lit moments - of which there are many. It looks very much like Paramount (who provided the transfer to Kino Lorber for Blu-ray distribution) didn't do anything to try and enhance the video quality at all. That's the bad news. The good news is that the daylight scenes still look pretty good, and because there doesn't appear to have been too much tinkering with the transfer (I'm sure some DNR has been applied, but it's very minimal), there are no major issues with banding, aliasing, or the various kinds of problems that pop up when an image is tinkered with too much. The presentation here also appears to retain the original color timing for the movie, which is a huge plus considering how many updated transfers of films I've seen in the past couple of years that have decided to take the intended look of a movie and "update" it to that god-awful orange and teal look that permeates so many modern releases. Granted, it would have been fantastic to see a remastered version of Scott's often beautiful-looking film, but knowing things could have been a whole lot worse, I'm not too unhappy with what we're given here, despite the problems. The only audio option (other than the commentary track) on the Blu-ray is an English 2.0 DTS-HD Master Audio track, which is fine for what it is, although the movie really cries out for a 5.1 or better track, given the movie's aural design. There are scenes in the movie - like when Columbus and his men first make their way into the inland of San Salvador - that are supposed to envelope the viewer/listener in a wall of sound that just can't be replicated with a 2.0 track. The above said, the track certainly is serviceable enough and at least allows the audience to enjoy the impressive musical score by Vangelis. Dialogue is also clear and understandable. I wouldn't go as far to call it crisp, but it's far from muddy and the mix here is proper, not allowing any of the movie's many ambient sounds to drown out the spoken word. Audio Commentary by Film Historians Howard S. Berger and Nathaniel Thompson - If you've never heard these guys do a commentary before, you're in for a treat. Mondo Digital's Berger and Destructible Man's Thompson are true movie buffs, and they give listeners the rundown on just about everything here, including how this film wound up getting made in the first place. Deleted Scenes (HD, 8:30) - There's no info about each scene, but I'm pretty sure this is the footage that was taken out of the American cut of the movie and that exists in the international cut of the film, as most of these moments have R-rated violence in them, including a guy's hand getting cut off, an arrow hitting another guy in the head, and super-bloody scene of Columbus stabbing someone to death. There are eight deleted scenes/moments in all. Trailers - A collection of six trailers, none of which include the original theatrical trailer for 1492 - memorable because it made great usage of German group Enigma's "Sadeness" and, in my opinion, is one of the most effective movie trailers from the 1990s. What we do get here are trailers for Mulholland Falls (HD, 2:00), Wild at Heart (SD, 1:50), Needful Things (SD, 2:01), Hidden Agenda (HD, 2:03), The House on Carrol Street (SD, 2:00), and The Rosary Murders (SD, 2:18). As historical films go, Director Ridley Scott plays as fairly as he can with the story of Christopher Columbus, making him a hero with some moral ambiguity instead of turning him into the genocidal monster than some modern-day scholars have attempted to do. There's much to admire in 1492: Conquest of Paradise, but the overlong film that tries to cover all of Columbus's adult life does come across as slow in spots. The borderline A/V quality of this Kino Lorber doesn't help with the appeal of this Blu-ray release, either. Still, even if you're just watching for the cinematography alone, Scott's movie is worth at least one viewing. Rent It.